I ORDER THIS CARTOUCHE AS A REPLACEMENT FOR A MOTHER'S RING - I HAVE ONLY ONE CHILD - I HAVE MY NAME ON ONE SIDE AND MY SON'S NAME ON THE OTHER SIDE. IT IS OUTSTANDING THE PICTURE DOES NOT SHOW ALL THE GREAT DETAIL IN THIS BEAUTIFUL PIECE OF WORK. HANY IS WONDERFUL, VERY COOPERATIVE, EASY TO WORK WITH AND WANTS TO GET YOUR ORDER RIGHT THE FIRST TIME. I AM ONE CUSTOMER THAT WILL ORDER AGAIN AND AGAIN. THANK YOU. WOW!!! 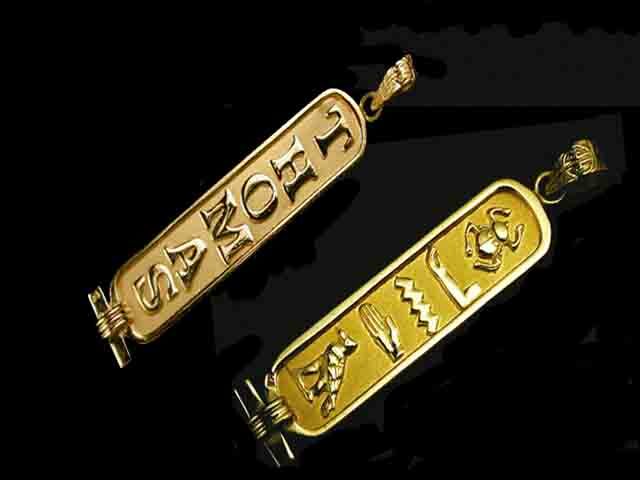 I ORDER THIS CARTOUCHE AS A REPLACEMENT FOR A MOTHER ..